Kochi also known as Cochin is a part of the Ernakulam district is Kerala. Take a Kochi flight and enter the beautiful land of Kerala to enjoy the backwaters, hills, tea gardens, etc. If you have planned to visit Kochi, get your flight tickets booked at Rehlat. You get the best deals and exciting discounts on every Kochi flight booking, be it one way or round trip. Save huge on your next Kochi trip, get your flight tickets booked here. 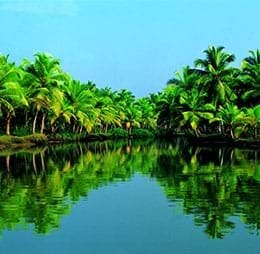 The intrinsic beauty of Cochin attracts travellers from all corners of the world to enjoy the fabulous vacation in breathtaking places with all its exotic seashores and lush green hill stations. Cochin is filled with magnificent attractions and landscapes including Fort Kochi, Hill Palace, Kochi Backwaters, Marine Drive, Mattancherry Palace, and Bolgatty Palace. No doubt, Cochin is the best place for shopping lovers, where you can find lots of malls, outlets, local markets and much more. Shopping in Kochi is an exciting experience for everyone. Mattancherry is a perfect place for shopping lovers, who are looking for trinkets and curios and the odd stuff that people choose as mementos. Kerala cuisine boasts a multitude of dishes, ranging from the mouth-watering traditional sadya to seafood delicacies. Experience the taste of exquisite Kerala dishes like Chemeen Pollichathu, Meen Murringakka Curry, Fish Mappas, Cheera Thoran, Kozikode Biryani and Kerala Fish Curry. Cochin has a vast number of best restaurants like Kerala House Restaurant, NBC Restaurant, Hotel Gazala, and Dal Roti. Kochi is an incredible holiday destination to enjoy great nightlife in clubs, discotheques and lounges. Whether you’re on a weekend mood or any other day, Cochin is one of the finest places to party in Kerala. The State of Kerala Transportation offers wide range of transport facilities for tourists to travel across the city in buses, taxis and trains. You can find large number of trains and buses connecting to different places at an affordable cost. Cochin International Airport is one of the largest airports in India that operates domestic and international flights to all major destinations. Being located 25 km from northeast of the city, this airport handles more than 9 million visitors annually. Terminal 1 is well equipped with some of excellent facilities include x-ray based manual screening, 36 passport control counters, 12 security gates and 12 customs counters. The terminal 1 is used for arrivals and departures of International flights. Terminal 2 handles both arrivals and departures of domestic flights. Cochin International Airport is well connected by Interstate taxi, city bus service, general taxi service, Interstate bus service, and car rental service to reach the city. Visitors can get a prepaid taxi service outside the airport arrivals at an affordable price.